Chicken Pesto Ciabatta. 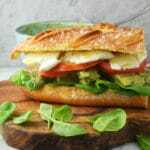 Perfectly cooked juicy chicken drenched in a creamy pesto dressing on a fresh and crunchy ciabatta with mozzarella and tomato. Pre-heat the oven to 180°Place one tablespoon of olive oil in a medium frying pan under a medium heat. Season the chicken fillets with salt and pepper then fry for around 3 minutes on each side until cooked through and juicy. Set aside on a cutting board to rest. Place the ciabatta in the oven for 3 minutes until warmed through, set aside. To make the pesto place the basil, pine nuts, parmesan, garlic, lemon juice and oil in a bowl and blitz together using a hand held blender (you can also use a small food processor attachment or mortar and pestle). Blitz until you have a thick paste then add the sour cream, season and mix until combined. Cut the chicken into strips and add to the pesto, mix together. cut the ciabatta in half then cut each half through the middle. Layer each bottom half with baby spinach then top with the chicken and pesto mixture. Top with slices of tomato and mozzarella. Spread each top layer with the mayonnaise and serve.